A mother is a person who seeing there are only four pieces of pie for five people promptly announces she never really did care for pie. Obesity now accounts for 9.1% of all medical spending. On average, an obese patient has $4871 in medical bills a year compared to $3442 for a person at a healthier weight. 34% of Americans (over 72 million) were obese in 2006, up from 23% in 1994. The average American is 23 lbs overweight. Collectively as a country, we are 4.6 billion lbs overweight. Don’t forget to check out www.fbenutrition.blogspot.com for great meal ideas. Please don’t forget your dues for Aug. Honest lunges with knees touching the ground and full extension of the hip and knee during every step. Elbow bridges are in a perfect plank position with no sagging of the hips. I would put doing 6 minutes a day of push-ups and pull-ups aginst this piece of crap any day. People that buy this stuff get enough exercise opening a bag of potato chips and chewing. I HATE EXERCISE INFOMERCIALS!!! Thanks for finding this Stephen. 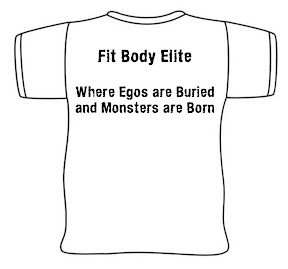 Here are the final t-shirt designs. I am taking pre-order sales now. We are going to do several colors so let me know what colors you like. 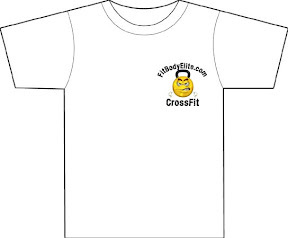 We are ordering both mens and womens shirts. The pre-order price is only $20.00 per shirt. Please let me know ASAP how many you would like and what colors. Check out our new Nutrition Blog. You can always find the link to it on the right under Links. You can also find information by clicking on the resorces tab above. Please remember that Monday is August 3rd so please remember your monthly dues. We are looking to move into a building very soon and I need to be able to pay the rent so any help you can give by getting your dues in on the first class of the month is GREATLY apperacated! I found this on the Crossfit Oakland site. Looking for a way to use that fruit that’s past its prime & attracting fruit-flies? Bake it! Baking ripe fruit allows the natural juices to come out and caramelize creating a super sweet yet healthy treat. You can do this with just about any fruit that has a skin. Today, I used pears. 1. Slice the fruit in halves or quarters and remove any seeds and stems. 2. Place a layer of fruit in a casserole dish or Pryex container skin side down. Use something that is deep enough to contain all the juices–cookie sheets won’t work. 3. Sprinkle fruit with cinnamon or apple pie spice. 4. Bake at 325 degrees for approximetly 20 minutes. 5. Let cool & enjoy! “A goal without a plan is only a wish”.